Gionee P8M is a budget-friendly smartphone for individuals who desire long battery life. 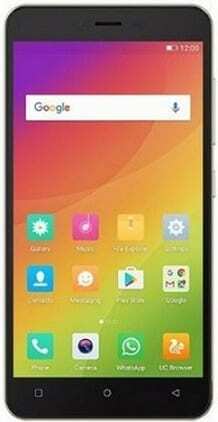 It features a huge battery, a 5-inch display, a quad-core processor, and Android Nougat OS. From the look of things, the Gionee P8M appears to have a plastic body to reflect its budget status. But that’s not to say it is a shabby device. It actually looks good with its curved corners. But about 9.2 mm means this is no slim device. Gionee P8M has a 5-inch IPS on-cell display with a resolution of 1,280 x 720 pixels. So, this should offer decent images and colours. If you are still in doubt, what the Gionee P8M offers in its camera department confirms the budget status. The primary shooter has 5 megapixels, while the selfie snapper has just 2 megapixels. You obviously cannot expect much here, in terms of image quality. Storage is only 8 GB. But the report is that you will be able to add another 128 GB using a microSD card. With a quad-core MediaTek MT6580 processor on the inside, the Gionee P8M will only do just enough when it comes to performance. The chip gets backing from meagre 1 GB of RAM. This one is obviously not for power users. The Gionee P8M ships with Android 7.0 Nougat software. Its maker coats the Google OS with its own Amigo 4.0 skin. The headline feature of this smartphone has to be its 4,000mAh Li-Po battery. You get a promise of up to 30 hours of talk time for this one. Standby time for the Gionee P8M is rated at over a month – one wonders how realistic that will be. The device offers ‘super power saving.’ It is not clear if there is support for fast charging, though. You will be able to use two Micro SIM cards at the same time on the Gionee P8M. But the best mobile connection available is 3G HSDPA, no 4G LTE. Other connectivity features include Wi-Fi (2.4 GHz) and Bluetooth 4.2. There is also support for USB On-The-Go (OTG).